Glioblastoma (GBM) is a highly malignant and aggressive primary cancer of the central nervous system. In GBM, the brain tumor or glioma arises from normal brain cells (astrocytes) and then grows very quickly, invading and residing in healthy brain tissue. This increases pressure within the brain and leads to headache, drowsiness, nausea and vomiting. Depending on the exact location of the tumor, other symptoms that may develop include vision changes, speech difficulties and memory problems. Patient prognosis is dire; even with the most aggressive forms of therapy, recurrence is likely and the mean patient survival time is less than 18 months. GBM is challenging to treat. Many different types of cells are present in the tumors and while some cell types may respond positively to certain treatments, others may have no response at all. A number of new treatment approaches have been developed, but no meaningful changes have been made to clinical protocol for more than a decade. Analysis of disease mechanisms in GBM has led to important findings regarding the significance of tumor size, heterogeneity and specific molecular characteristics in the accurate modeling of this condition. Traditionally, gliomas have been classified based on their appearance under a microscope (histology), but more recently, molecular classification techniques have been developed that help to stratify gliomas based on specific gene mutations and gene expression patterns. These techniques are providing new insights into the important roles that molecular features and tumor heterogeneity play in predicting tumor development, treatment response and prognosis. Accordingly, researchers are keen to develop animal models that would enable clinical imaging of large, pleomorphic tumors in future pre-clinical studies. Physicians and researchers working in the glioma field are interested in new approaches that incorporate both histology and molecular biology modalities to enhance glioma modeling and classification for improved stratification in clinical trials and a better understanding of glioma molecular subgroups. Previously, preclinical research using rodents often involved the implantation of certain cell lines such as C6 and 9L into the rat brain. By contrast, genetically engineered animal models enable spontaneous tumor formation in the host environment, which offers great advantages over transplant-based models because biological changes that occur in human cancer can be accurately engineered. Tumor initiation and progression, as well as potential therapies can be studied in a disease microenvironment that also evolves in the context of neoplastic processes. Genetically engineered mouse models have started to take the place of transplant-based rat models because their genetic manipulability enables the generation of more accurate models. However, the smaller brain size of the mouse limits the time allowed for tumor growth and therefore the clinical relevance of experimental imaging and interventions. The RCAS/tv-a gene delivery method utilizes the fact that the replication competent avian-like sarcoma (RCAS) virus requires cell surface expression of its avian tumor virus A (tv-a) receptor to enter target cells. Mammalian cells do not contain the tv-a gene and are usually resistant to the virus. However, by inserting this gene into specific cell types, researchers can ensure the receptor is expressed on cells of interest. Now, researchers from the University of Maryland School of Medicine, Baltimore, have developed a transgenic rat model based on the RCAS/tv-a system that allows the formation of large, heterogenous gliomas that closely resemble those seen in human GBM. The tv-a gene was inserted into rats and controlled intracellularly by the nestin promoter, which is activated inside neural and glial progenitor cells. These cells have been implicated as brain tumor initiating cells (BTICs) and in the formation of human GBM. Tv-a specific RCAS vectors that had been engineered to alter the expression of genes involved in human cancer, could then enter the BTICs. The resulting overexpression of platelet derived growth factor subunit A (PDGFA) combined with depletion of the tumor suppressor p53 induced glioma growth in all of the rats. Nina Connolly and colleagues used the BioSpec 70/30 USR 7T horizontal bore MR scanner from Bruker to obtain images of the tumors formed. This state-of-the-art scanner enables high-resolution structural, functional and molecular MR imaging in vivo and ex vivo. It was equipped with a high-performance BGA12S gradient system and interfaced to a Bruker Paravision 5.1 console. The researchers were able to confirm and visualize the formation of large, heterogenous tumors that showed malignant progression to high-grade gliomas over time. 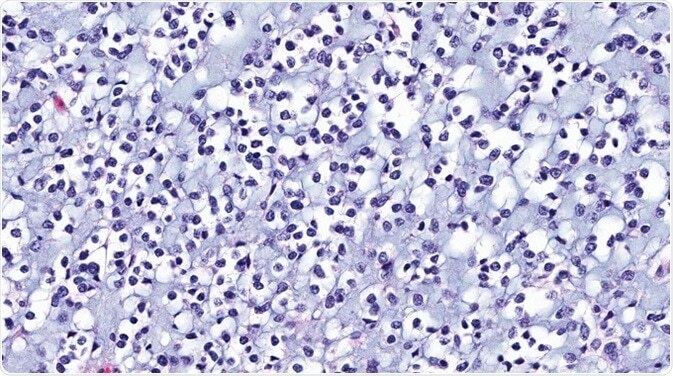 Histopathological analysis showed the tumors closely resembled many features of human GBM, including necrosis, high tumor cell proliferation, microvascular proliferation and lymphocyte infiltration. Connolly and team say this inducible rat transgenic model provides highly relevant histology, MRI and biological inter-relationships related to accurate modeling of tumor formation and progression in human glioma. The model may enable detailed interspecies comparison of fundamental cancer pathways and clinically relevant imaging and interventions that are limited by the smaller size of the mouse brain. Ahronian, L and Lewis, B. Using the RCAS-TVA system to model human cancer in mice. Cold Spring Harbor Protocols 2014(11):1128-35. DOI: 10.1101/pdb.top069831.